This recipe is based on the same technique as a previous post...it's a sort of stove-top steam/roasting. By turning the heat low and covering the pan with a lid it creates a sort of oven/steamer, which not only draws the flavors out but also caramelizes (concentrates) them. As usual, this recipe is not written in stone, rather than a blueprint it should serve more as an idea. Mix-and-match ingredients that you like. You won't be sorry...and you'll only have one pan to wash.
Heat the olive oil in a medium skillet over medium-high heat. 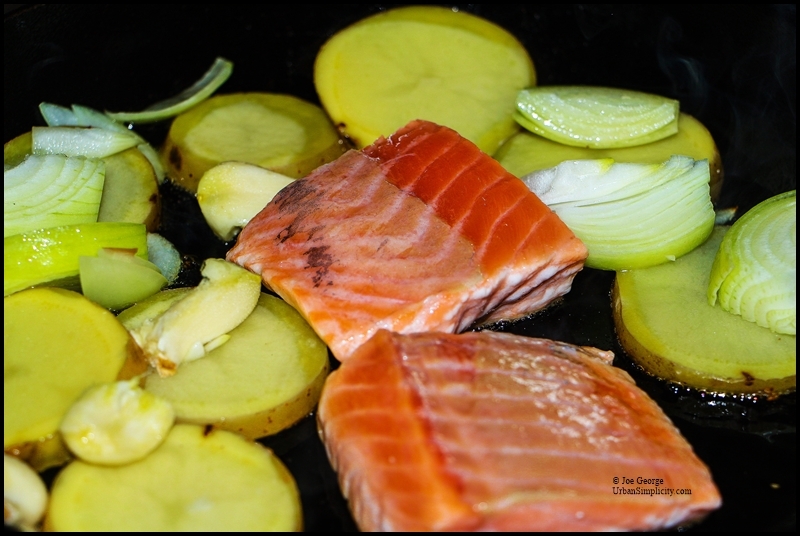 Place the salmon in the pan, and then arrange the potato, onion, and garlic around the salmon in a single layer. Season with the salt and hot pepper. Cover the skillet and lower the heat. Cook for about 5 minutes. Remove the lid. Turn the potatoes and onions but not the salmon; leave it in the same position. 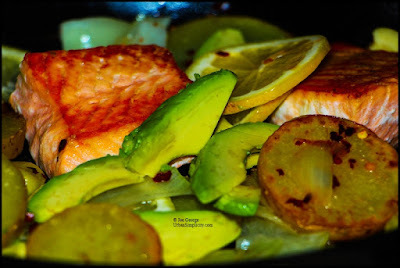 Lay the lemon slices on the salmon and vegetables. Cover the skillet again, and cook for another 5 minutes. Remove the lid, lay the avocado on the salmon and vegetables, shut off the heat and allow to rest for a couple minutes. To serve, gently turn the salmon over (which will be nicely caramelized), transfer it to plates or a platter, and arrange the vegetables and lemon around the salmon.